Welcome to the Dublin Simon Community Winter Newsletter. The newsletter will update on recent changes and developments in our services. As we move into the colder winter months, our community of supporters becomes more and more vital. Last week saw the release of the official rough sleeper count which reported 156 people as sleeping rough on one night in November across the Dublin region alone. This compares with 110 in the 2018 spring count, a 42% increase, and down 15% from 184 found during the 2017 winter count. This figure is concerning and we look forward to the upcoming delivery of 233 extra emergency beds in the capital as part of this year’s cold weather initiative. Our Rough Sleeper Team and Soup Run teams are out on the streets 365 days of the year, as a first point of contact and support for people who are faced with this unbearable reality. Our Christmas campaign #journeyhome is about this outreach as a first step towards the necessary healthcare, accommodation and support that we provide to help people from the streets and into a home. The all-time high numbers in emergency accommodation and the prevalence of people sleeping on our streets, emphasises the urgent need to provide housing so we can prevent people from becoming homeless in the first place. Moving people into long term accommodation, while keeping people in their homes and working with households at risk are important priorities for Dublin Simon Community. We always love hearing from our community of kindness. As a valued supporter, if you ever have any questions or would like to learn more about our services or how you can get involved please contact us at inforequest@dubsimon.ie. From all of us at Simon, thank you for anything that you can do to help and wishing you the very best for the festive season. Supporters like you mean we can continue to provide creativity and educational services. 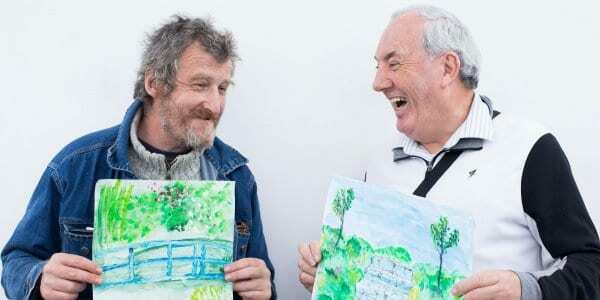 Dublin Simon Community clients were delighted to see their artwork on display at a recent exhibition. 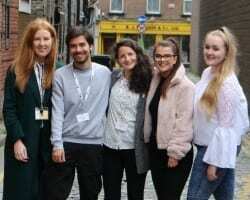 The exhibition took place at the Temple Bar Gallery and Studios and marked the launch of Scrappy But Happy 8, a book of creative writing and artwork showcasing the amazing talent of people who access our homeless, housing and treatment services. The launch also featured our Client Recognition Ceremony, marking clients’ participation during the year. The Literacy and Personal Development Team co-ordinates and facilitates a range of classes and therapeutic programmes across our services. The team facilitates arts and crafts, creative writing, dance, computer and gardening groups as well as literacy tuition and open mic nights to inspire creative thinking and encourage self-expression. Our events and workshops celebrate diversity, equality and inclusion. They are a beautiful representation of the wonderful creative talents of those accessing our services. 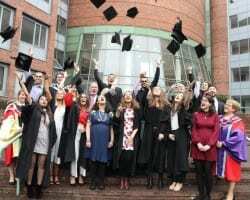 Learn more about our education and employability. It is only with the kind support from people like you that our Rough Sleeper Team are out on the streets 365 days a year, engaging with people experiencing homelessness. Funded by our community of donors, the team offer a range of life saving supports to people who are sleeping rough. They help people with their immediate physical health needs and accessing a safe bed. They support people in mental health crises and help move towards the long term care they need through counselling or mental health services. They also work alongside our Soup Run, Breakfast Run and Social Club to provide sleeping bags, food, clothing and toiletries. The team provide the Mobile Health Outreach Clinic, run in partnership with Safetynet Primary Care, offering supports and medical services to people rough sleeping, targeting those who may not be linked into other health services. The Rough Sleeper Team also has a harm reduction focus, providing emergency needle exchanges out of hours to people suffering from an addiction. They advocate for and support clients to access appropriate services such as residential treatment, supported temporary accommodation, long term housing and health services to help them on the pathway out of homelessness. You can support services like our Rough Sleeper Team by making a donation. We officially opened our Step Up Step Down Intermediate Care facility in September. The 12 bed unit provides life saving medical care to people who are homeless. 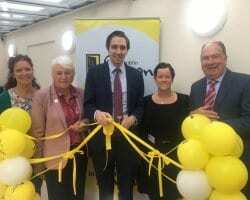 Launched by Minster for Health, Simon Harris TD, with Minister Catherine Byrne TD, the step up beds will stabilise patients for hospital admission or assessment for further treatment while also enabling them to recuperate, rehabilitate and move to accommodation following a stay in hospital. Delivered in partnership with Safetynet Primary Care, and in collaboration with other hospitals and key stakeholders in the homeless sector, this service is the first of its kind and will ensure that we improve health outcomes for people who are homeless. The Step Up Step Down facility is part of our vision to increase the capacity of our Medical Residential Treatment and Recovery Facility at Ushers Island to 100 beds. This purpose built facility is Dublin Simon Community’s response to the high demand for health, addiction treatment and recovery services. Learn more about our treatment services. 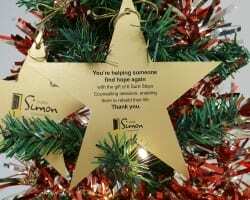 Purchase a Simon Star as a gift for a family member or a friend this Christmas and you will also be giving a meaningful gift of hope to a person facing homelessness. Each star represents a vital service that Simon provides. Star options range from helping our outreach teams provide personal care packs for people sleeping rough on our streets, to counselling sessions with our Sure Steps service to helping fund light and heat for one week in one of our supported housing services. You will help people like Mary find the hope and strength to start their journey out of homelessness. 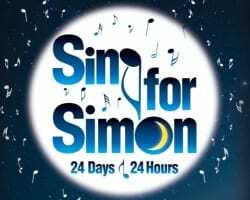 Running throughout December, each year Sing for Simon brings together groups to raise funds for our services. Whether you sing in a choir, a band, or even just in the shower, we’d love you to join our campaign for 2018. Gather your group and arrange your own carol singing event in your local area, or join in one of ours! We have pre-booked locations across Dublin City Centre and shopping centres. Sign up individually or arrange a group to take a two-three hour slot. We are looking for all the support we can get on the day so please take a break from your Christmas shopping and shake a bucket with us! 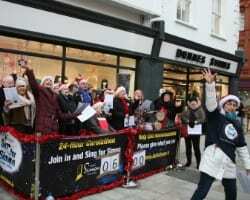 Our Carolathon starts on Friday, 14th December on Grafton Street. We are also looking for plenty of volunteers over the course of December for bucket shaking, event support, bag packs and more! Please contact us if you would like to get involved. To get involved and support Dublin Simon Community this Christmas or if you would like to organise your own event call Grace on 086 174 6080 or email Grace@dubsimon.ie. At the core of any community are its people. Our volunteers and staff deliver the vital services that we provide to tackle the multifaceted issues of homelessness. We work with some of the most isolated and vulnerable people in our society and we do it with dignity, respect and pride. Working in teams of committed, innovative, and passionate people who are determined to tackle the challenges of homelessness and change the footprint of society. Our community is growing and we are looking for people who share our work ethic and our mission. We welcome applications from graduates and professionals who are in search of meaningful, impactful, and life changing work. We believe in empowering our employees and volunteers as much as we do empowering the people who access our services. If this sounds like the type of Community that you would like to be part of we would love to hear from you. We would love to see our community of supporters at some of our upcoming Christmas events. Here are some of the key dates for your diary between now and the end of the year.